2 YRS Weifang Mayshine Imp & Exp Co., Ltd.
1 YRS Dongguan Junsheng Packing Material Co., Ltd.
Our advantages 1. best service 2. free design 3. no moq 4. high quality and low price Pictures show Usage picture Packaging & Shipping Hangzhou Ouhong Garment accessories Co. , Ltd is one of the professional garment accessories supplier in Hangzhou, Zhejiang, China, enjoying high reputation at home and abroad. We can service many kinds of garment accessories, including Hang Tag Printed, woven label,hang tag, care/washing label, rubber &leather patch, embroidery patch, shopping bag, plastic tag,sticker and so on. It is the final layer between your client and your product, and sets the expectations high for what will be revealed underneath. 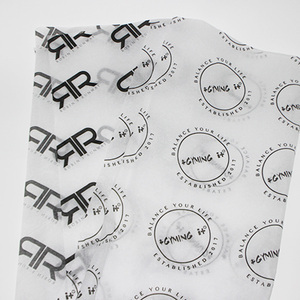 Custom printed tissue paper is one of the most delicate and detailed options you can find. 2), How long my own logo tissue paper can be finished after order9 Around 3-7 days, different quantity, different time. *4. We can meet all your requirments. 4. OEM Accepted : We can produce any of your design. 4. A:How long can I get them9 B: The sample time is about 4-5 days. waterproof packaging paper for clothes packing custom printed logo gift cotton tissue paper 1.Materials:17g Tissue paper 2.size:50x76cm,If you need other size,please contact us. 3.logo:1 color logo,if you need more color,please contact us. 4.Before you place a order,please contact us. We feel prond to supply premium, morden paper products with stylish designs to upscale goods more than 10 years. 2) What kind of design files do you accept for printing9 Please provide us with the vector AI or CDR design file. 3) Can you do the design for me9 Yes, simple design is offered for free by our professional designers. The factory equiped auto waterbase printing machine and cutting machine. Related Products 1.what quantity is your tissue paper 's Mini order9 Our MOQ=1000pcs 2. How long do you finish the order. Our production time:10-15days 3. what is your payment way9 we accept paypal,T/T,western union or order on Alibaba with trade assurance . 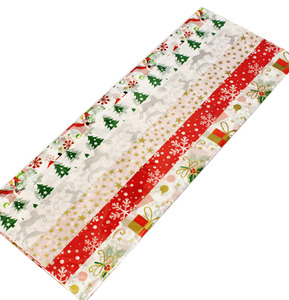 Alibaba.com offers 49,704 printed tissue paper products. About 27% of these are specialty paper, 7% are paper napkins & serviettes, and 2% are kraft paper. A wide variety of printed tissue paper options are available to you, such as moisture proof, anti-curl, and waterproof. You can also choose from specialty paper, synthetic paper, and craft paper. As well as from free samples, paid samples. There are 49,704 printed tissue paper suppliers, mainly located in Asia. The top supplying country is China (Mainland), which supply 100% of printed tissue paper respectively. Printed tissue paper products are most popular in North America, South America, and Western Europe. You can ensure product safety by selecting from certified suppliers, including 11,681 with ISO9001, 8,044 with Other, and 1,956 with FSC certification.